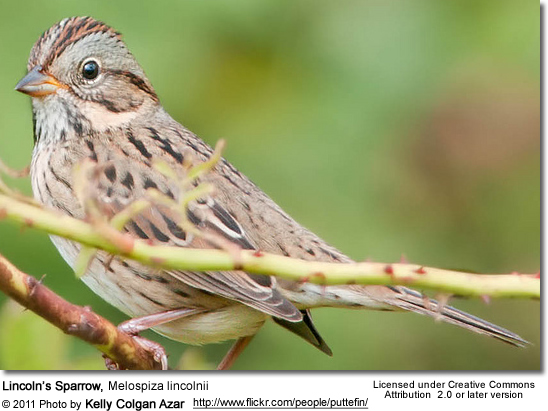 The Lincoln's Sparrow, Melospiza lincolnii, breeds in wet thickets or shrubby bogs across Canada, Alaska and the northeastern and western United States; this bird is less common in the eastern parts of its range. These birds migrate to the southern United States, Mexico and Central America. This bird was named by Audubon after his friend, Thomas Lincoln. The nest is a well-concealed shallow open cup on the ground under vegetation. This is a medium-sized sparrow. Adults have dark-streaked olive-brown upperparts with a light brown breast with fine streaks, a white belly and a white throat. They have a brown cap with a grey stripe in the middle, olive-brown wings and a narrow tail. Their face is grey with brown cheeks, a brown line through the eye and an eye ring. 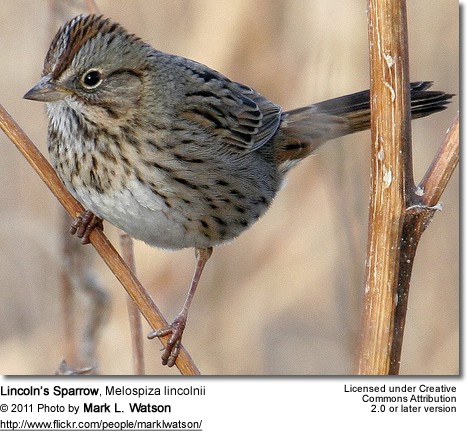 They are somewhat similar in appearance to the Song Sparrow. They forage on the ground in dense vegetation, mainly eating insects and seeds. They are very secretive. Their song is a musical trill, but this bird is often not seen or heard even where they are common.